It was a real treat for me to travel out to Pittsburgh, Pennsylvania for this year’s International Conference on Creationism from July 29 through August 1. The conference has been held only once every four to five years since 1986, and I enjoyed the last one in 2013 so much that I was determined to return. I say it’s a treat because I was able to meet and listen to scientists from around the world and various disciplines presenting their latest research, many of whom I’ve had the pleasure of reading their work and come to admire. And now that I’ve returned home, I have a larger collection of their books and documentaries to delve into! So it’s always cool to meet these people in person, get to know them, and bombard them with questions. Ken Ham opened the conference with a Sunday evening keynote presentation on the importance of Genesis and research in biblical creation. Genesis is foundational for all Christian doctrines. Hence, attacks on Genesis have naturally contributed to the rejection of Christianity in this nation and around the world. Ken is a superb speaker particularly on this topic and the response was very positive. Keven Anderson delivered a fascinating keynote presentation on the soft tissue that paleontologists are regularly finding in dinosaur remains. Such soft tissue decays quickly and cannot last millions of years, which confirms the biblical timescale. Dr. Anderson showed the results of studies that had measured the rate of decay of substances like collagen which are found in dinosaur remains, and yet cannot last vast ages. The following evening, Dr. Steve Austin presented on the topic of geology. He showed how rapidly deposited mud can account for the evidence we find in geologic formations. There is simply no need for millions of years. I was very honored to be asked to give the closing keynote presentation on the topic of the problems with evolutionary cosmology. I presented a summary of the big bang model, and then critiqued it in five areas, including its unscientific nature and the many problems published in the technical literature. I showed evidence for a young universe and how distant starlight can arrive at Earth within the biblical timescale. I concluded by showing how science is only possible because biblical creation is true. The ICC also had panel discussions in which four experts in a given discipline debated various important issues and answered questions from the audience. The biology panel addressed the issue of baraminology – the study of animal kinds. This ongoing area of creation research attempts to assess which modern species are genuinely biologically related to each other and therefore belong to the same created kind. The geology panel focused on the topic of the location of the flood / post-flood boundary in the geologic column. Creationists have often held that the Cretaceous system corresponds to the final flood deposits, with Tertiary sediment representing post-flood deposition. But recent research has challenged this notion, placing the post-flood boundary considerably higher – though not everyone agrees. 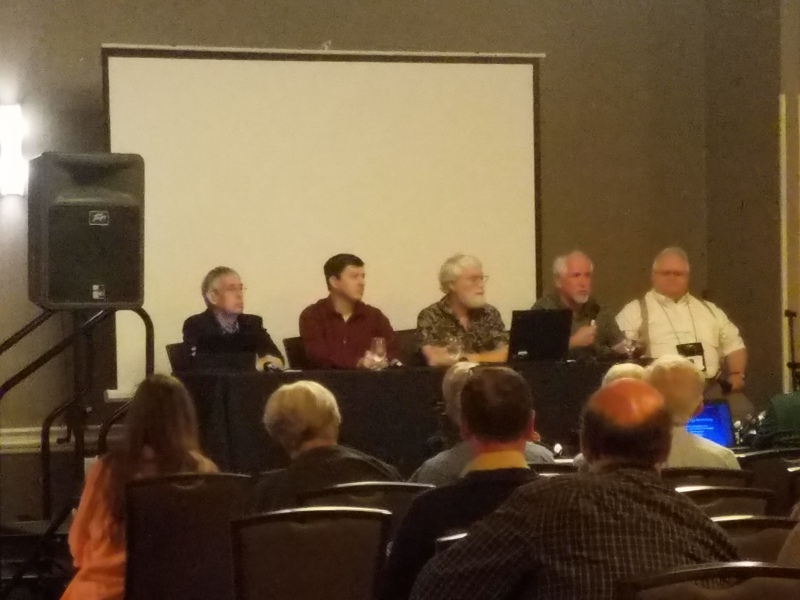 I was invited to participate in the astronomy panel discussion along with Danny Faulkner, Russ Humphreys and Phil Dennis. Bob Hill moderated as we discussed our various ideas on creationist cosmological models. We actually agree on quite a lot. And there was some good-natured ribbing when we disagreed, which made our panel discussion lighthearted and humorous. Yes, we disagree on some things, but we really do like and respect each other. And it was great fun.